UPDATE 1730 GMT: Regime officials are giving new accounts for their imprisonment of environmentalists. He claimed the detainees used environmental issues as a cover to install cameras in strategic sites. He also accused them of creating “environmental crises” and transferring data to the US. Doulatabadi said the guilt of the political prisoners was established by their attendance of conferences in Israel of MENARID, an organization pursuing integration of management of natural resources. Targeting the Persian Heritage Wildlife Foundation, he alleged two US intelligence officers had traveled undercover to Iran to create the institute to collect classified data about #Iran’s defense and missile programs. Dolatabadi: one of the suspects named M. T. (Morad Tahbaz?) with Iranian, American & British passports who was main financier of Persian Wildlife Heritage Foundation and Iranian-Canadian Kavous Seyed Emami were among main middlemen for the American intelligence officer. Responding to journalists’ questions about the case, Hassan Firouzabadi, senior military advisor to the Supreme Leader and former armed forces Chief of Staff, said he did not know the details. Several years ago, some individuals came to Iran to collect aid for Palestine….We were suspicious of the route they chose. In their possessions were a variety of reptile desert species like lizards, chameleons….We found out that their skin attracts atomic waves and that they were nuclear spies who wanted to find out where inside the Islamic Republic of Iran we have uranium mines and where we are engaged in atomic activities. UPDATE 1430 GMT: Conservative Iranian outlets are declaring that the family of Dr Kavous Seyed-Emami, the professor and environmentalist who died in custody, have accepted the official claim of suicide. According to Tasnim, Seyed-Emami’s brother Kamran said the detainee had killed himself and called upon the media to respect the family’s privacy and not exploit the death for political purposes. He added that some media had “constantly pressure us to force us to make false statements”. Tabnak said authorities showed the family a video in which the political prisoner entered his cell toilet with a shirt, presumably with which to hang himself. Later, prison guards, delivering breakfast, found his body on the floor. Azad News Agency says the family has not requested an autopsy and considers the matter closed. A member of Parliament’s Presiding Board, Ahmad Amirabadi Farahani, gave a similar version of events to Fars, the outlet of the Revolutionary Guards. A senior official in Iran’s Environment Ministry has been released from prison, but other environmental researchers and activists remain in detention. On Monday, Kaveh Madani, the Department’s deputy chief for international affairs and innovation, was freed after his arrest over the weekend. 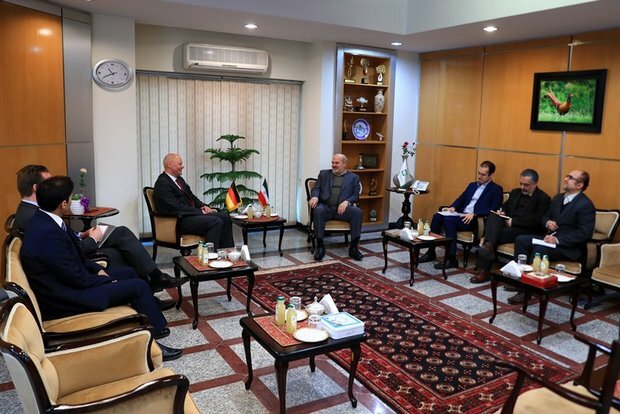 The Department released a photograph of the official with Environment Minister Isa Kalantari, in a meeting with the German Ambassador. Madani posted on Instagram, expressing hope for resolving the “problem” of several staff — reports vary from seven to nine — of the Persian Heritage Wildlife Foundation who have been detained. He called for “transparency, restoration of justice, and an end to narrow-mindedness”. Madani did not mention his own arrest, but just said that he had “gone to work Monday morning”. Madani’s communications are still being restricted. Except for Instagram, his social media pages, including his Twitter account, were suspended on Sunday and have not been restored. The Managing Director of the Persian Heritage Wildlife Foundation, Iranian-Canadian dual national Kavous Seyed-Emami, was arrested on January 24 and died in custody. Officials notified his family on Friday and said Seyed-Emami, a professor of sociology at Tehran’s Imam Sadeq University, hung himself — the same explanation they gave for the deaths of two detainees during last month’s nationwide protests. Academics from Iran’s leading associations in political science, sociology, peace studies, and cultural studies wrote President Hassan Rouhani, calling for an investigation of Seyed-Emami’s death, saying the official account is “not believable”. Vice President Massoumeh Ebtekar, a former Environment Department head, said she is “extremely worried” about the detentions of the environmentalists, although she said she would rather not talk about the case. The Iranian rial. already at an all-time low, is sliding further against the US dollar. The latest official rate in Tehran markets is about 48,750:1. The rial has lost about 20% of its value in recent weeks, with long lines and even scuffles reported at exchange offices as Iranians try to trade the rial for foreign currency before another devaluation. At its low point during the Ahmadinejad Administration (2005-2013), the rial did not pass 45,000:1. Several pollsters, surveying views about protests in late December and early January, have been arrested. ISPA surveyed 4,500 people nationwide from January 5 to 15. Almost 75% of those questioned expressed dissatisfaction with domestic affairs in the country. Almost 70% believed that the main demand of the protesters was a better economy and more jobs. Other motives cited were an end to financial corruption, injustice and ending support for “some countries such as Syria and Palestine”, freedom of expression, and the release of opposition leaders under house arrest.